Niagara Falls NY is the Perfect Place for an Enchanting Vacation or Honeymoon! With so much to do and so much to see, Niagara Falls in western New York is the perfect destination for tourists, vacationers, and honeymooners alike. Of course there's the wonderful Falls, which are beautiful in both daylight and nightlight. Nightlight? Yes, of course; every night, the falls are illuminated in vivid multicolor, adding to their beauty and majesty. But there are so many more adventures awaiting you in Niagara Falls, aside from just peering over the railing at the glorious Falls. Niagara Falls challenges daredevils to "plunge in" and take advantage of all it has to offer. Powerful jet boats speed up the great Niagara River, carrying brave voyagers between Letchworth State Park's 500-foot canyon cliffs, known fondly as the "Grand Canyon of the East." Letchworth State Park is also a great place for nature lovers, boasting over 14,000 acres of rugged splendor along the Genesee River, including three waterfalls. Or, for the brave, why not go on a tour to get closer to the Falls than ever before? Elevators dive over 170 feet into the great Niagara Gorge carrying a group of courageous passengers. Guests are equipped with special footgear and waterproof ponchos as a tour guide leads them on a mission to get up-close and personal with the mighty Falls. The trek leads guests just 20 feet away from the Falls, the constant mist engulfing them as they stare in wonder at the rushing wall of water. 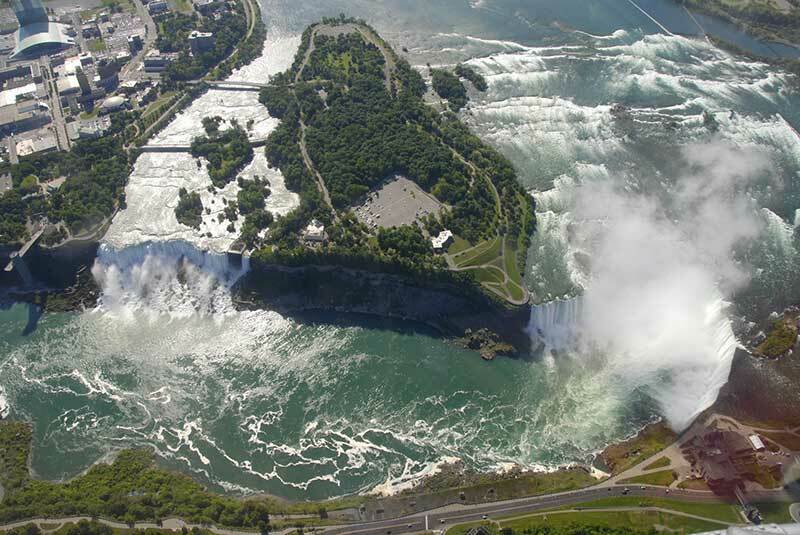 Niagara Falls certainly does not fall short of adventurous escapades, and it offers a wide range of accommodations to fit any budget and any preference. There's also plenty of shopping, excellent restaurants and bars and so much more in Niagara Falls. Whether you're looking for an exciting adventure or a peaceful getaway, Niagara Falls is the place to be in western New York. Come discover all that Niagara Falls has to offer!